Highfields was a lofty dream. It began in 1988, when the owners stumbled on a “For Sale” sign at an 11-acre wooded lot. With their 3 young boys, they began an annual camping tradition: staking tents, cutting down trees, lugging in drinking water, having bonfires, jumping off the neighbor’s dock into the cold Maine water. Ten years later, they built a small cabin; still no water or electricity. Twenty years later (still lugging that water!) they purchased the Point, an 18-acre adjacent parcel with rolling fields down to the tidal river. They cut more trees, dug a pond, planted meadows… slowly transforming the woodlot into a saltwater farm. In 2010, they discovered Knickerbocker Group and the next leg of their adventure began! 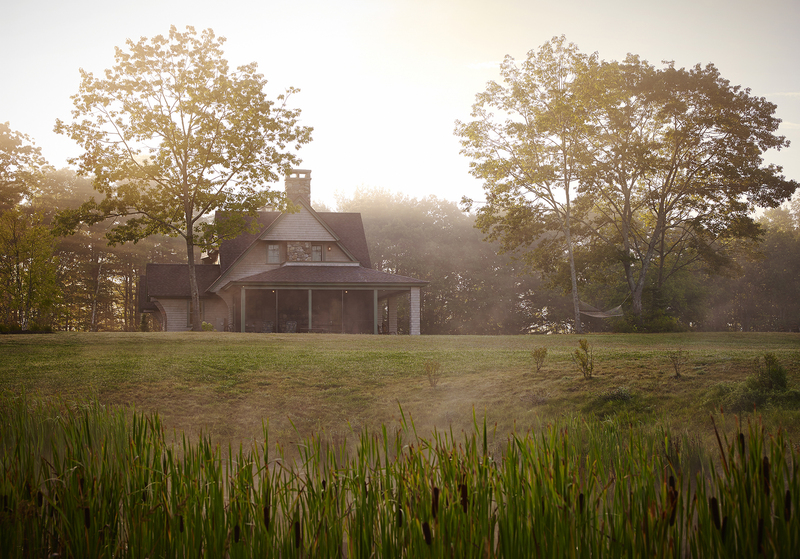 Now working with 29 acres, we found the perfect spot for their home: the top of the knoll, exactly where the owners had decided to build their cabin in the woods all those years ago. 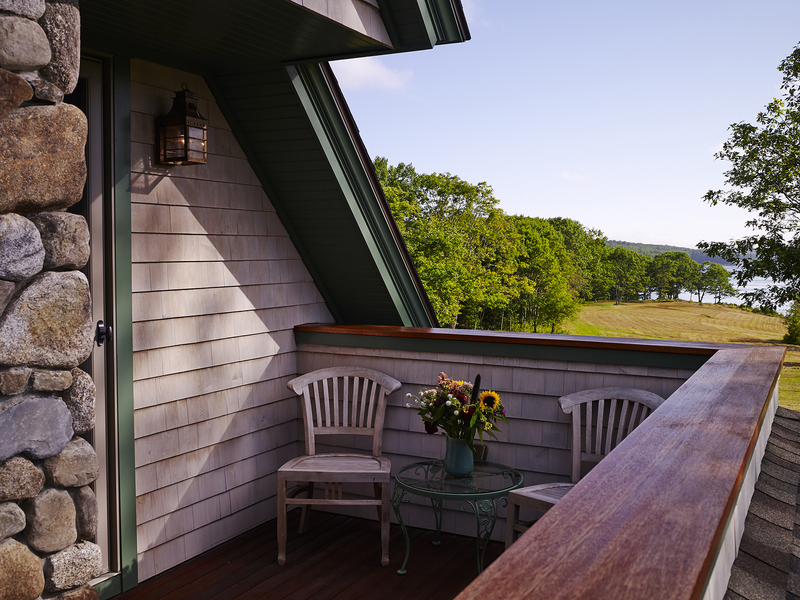 In the saltwater farmhouse, you can feel the intimacy and shelter from the close woods to the north, capture filtered views of the river to the east, and take in long sweeping views down the hillside, to the relocated cabin on the meadow’s edge, to the saltwater beyond. 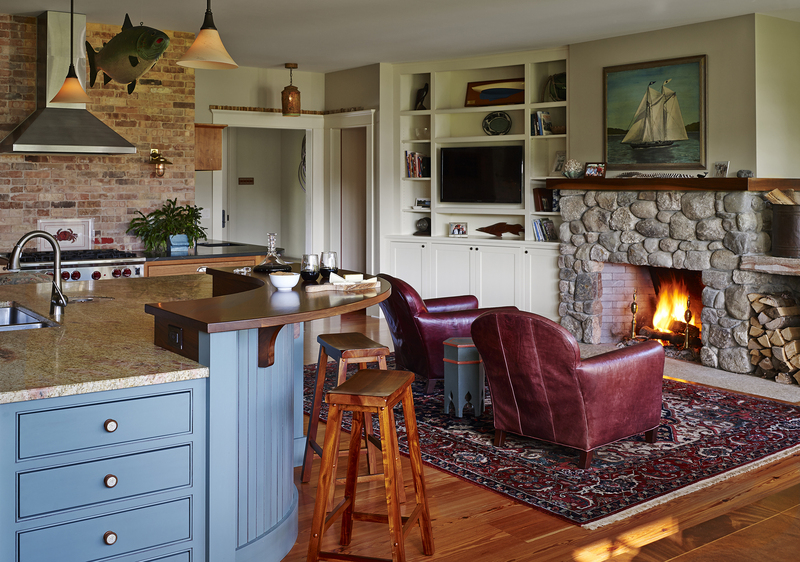 The design of the home is traditionally elegant, with detailing reminiscent of Maine’s old saltwater farms. 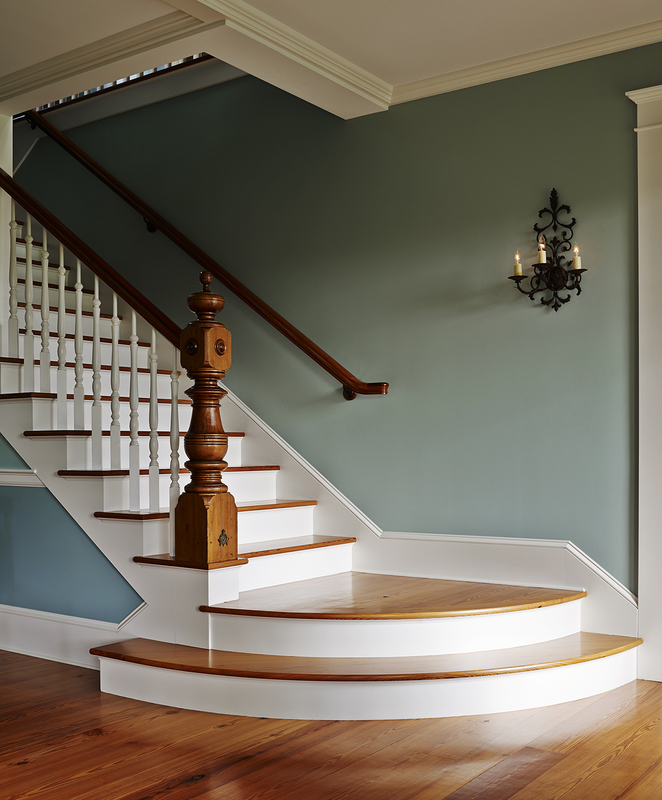 The living room is the most formal, with a fieldstone fireplace, coffered ceiling and an antique newel post at the base of the stairs. The owner’s uncle saved the newel from The Willows Hotel in Prouts Neck before it was torn down, and kept it in storage for over 40 years before it found its new place of honor at Highfields. 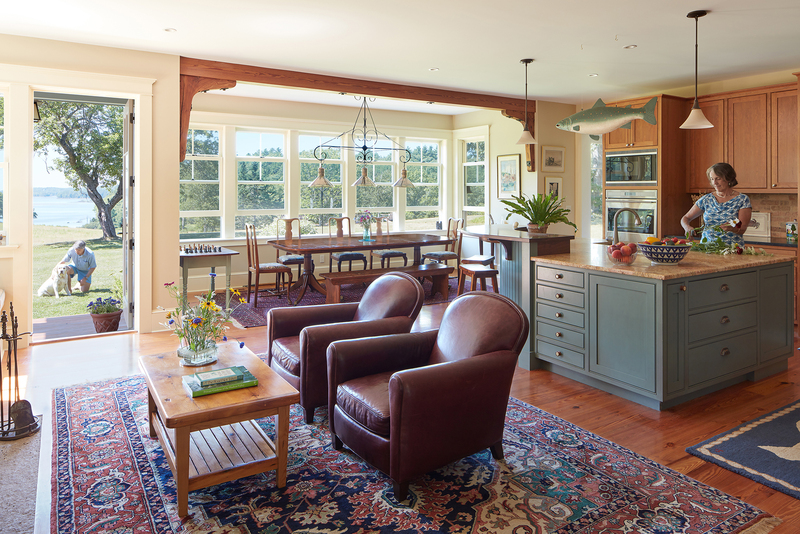 Over the years, the homeowners amassed a collection of maritime art and antique furniture that brings a distinctive nautical feel to the saltwater farmhouse. Both avid sailors, the owners met on the Westward; the schooner and that fateful day now memorialized in the painting over the fireplace. 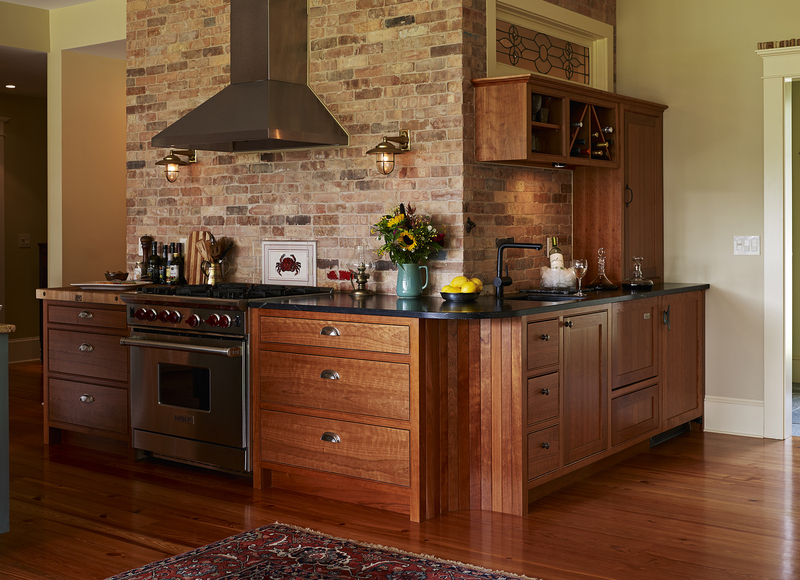 All throughout design and construction, they scoured local antique and salvage shops for other special finds that would lend to the historic feel: antique sconces flank the stovetop, the bricks behind were reclaimed from old factory demolitions in Chicago. 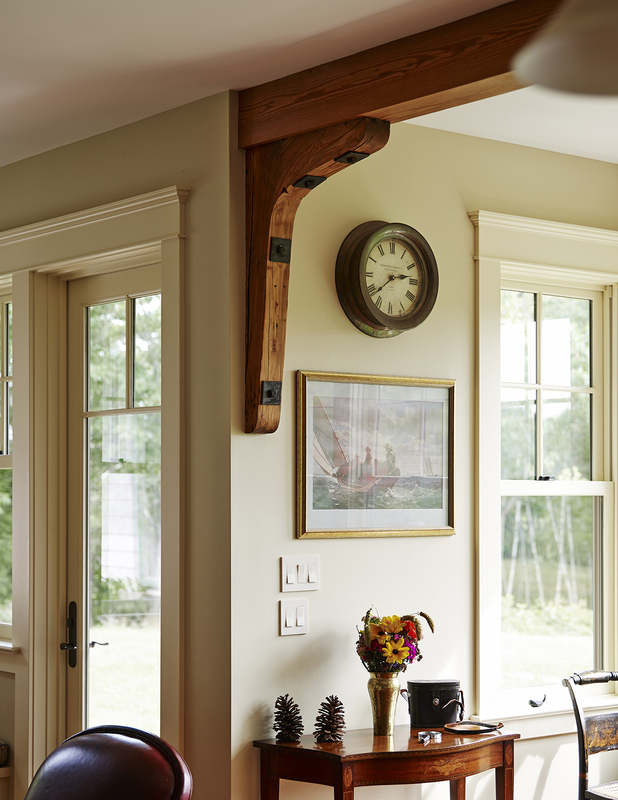 In the foyer, an antique light fixture hangs from the barrel ceiling, the beams arched as in the belly of a ship. 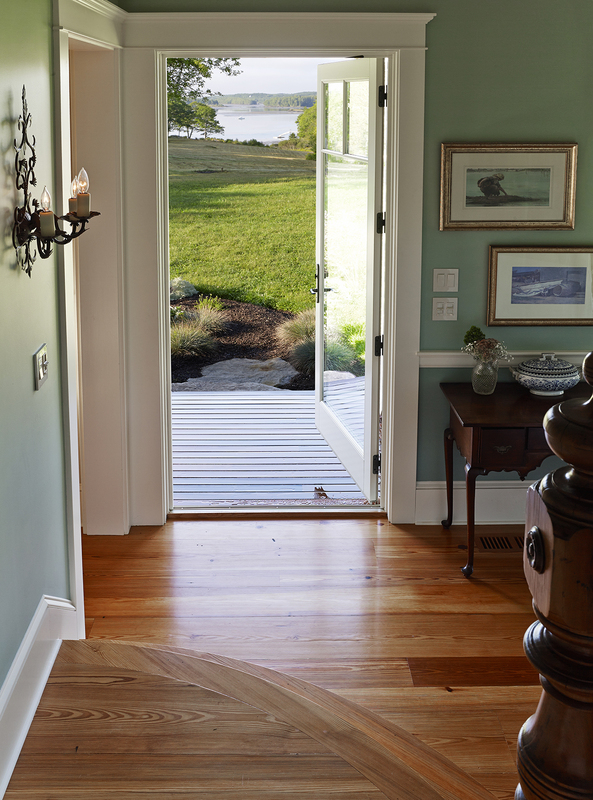 Pocket doors open to the living room, offering long views from the entry to the meadow and to the river. Custom farmhouse trim tops the leaded glass transom window, another salvage find. 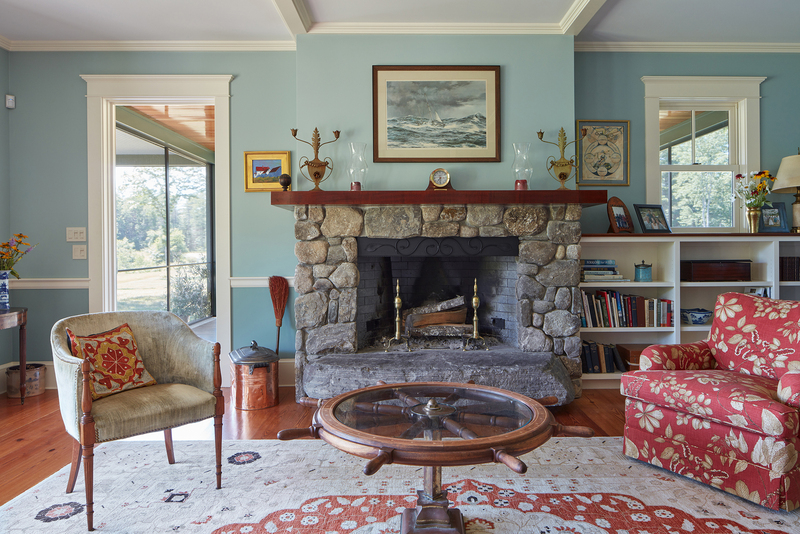 Elsewhere in the home, ship’s knees anchor a beam between two spaces; interior antique transoms cast light between rooms. 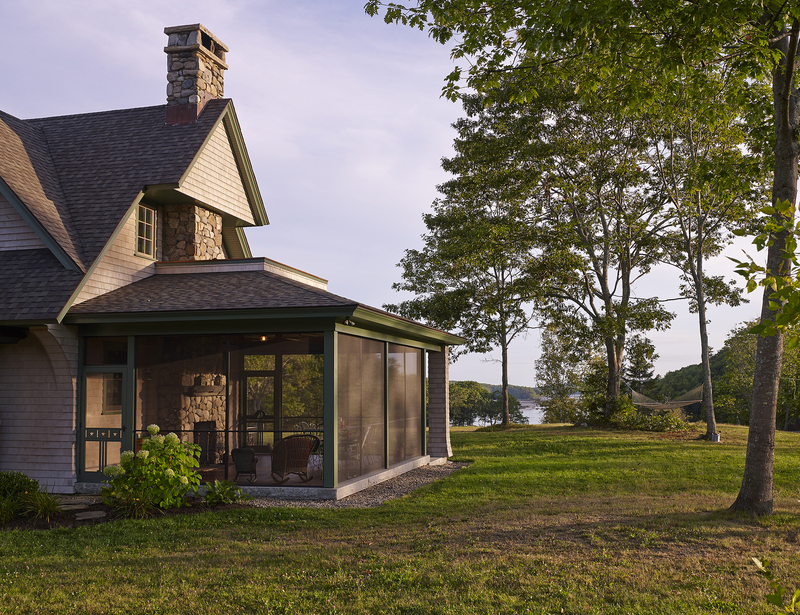 After all those years living off the land, the owners wanted to maintain a strong connection to the outdoors. A covered porch wraps the waterside. 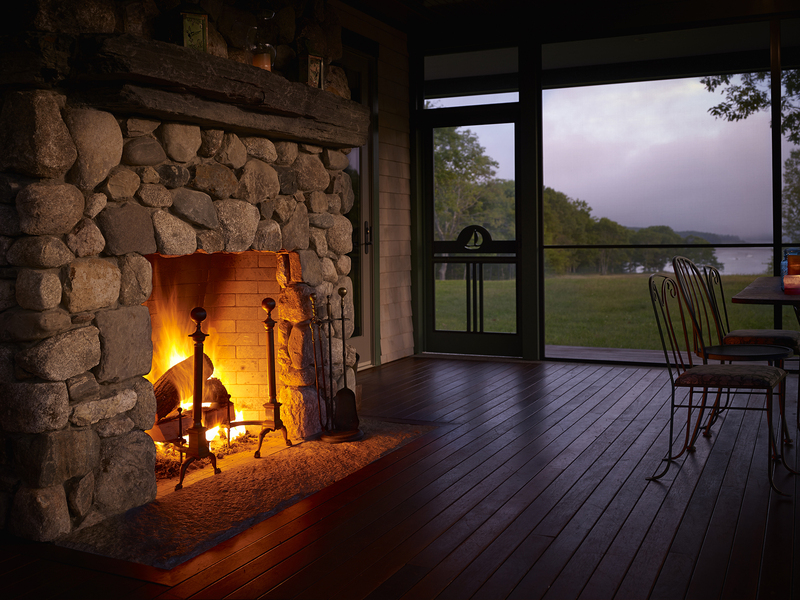 A second floor master suite balcony sits over the screen porch; a fieldstone fireplace warms this outdoor room in spring and fall. 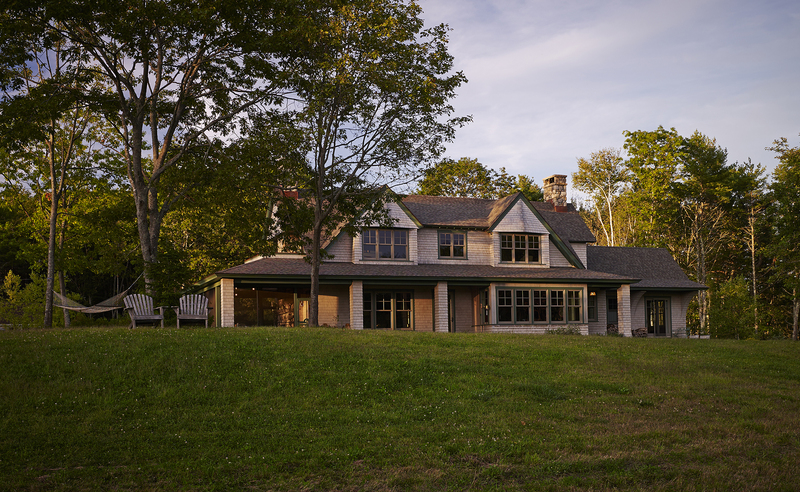 A perfect ending to their 25-year adventure, the owners completed the saltwater farmhouse just in time to host their son’s wedding in the meadow. Not surprisingly, the guests slept in tents, carrying on the family’s long-time camping tradition.